Madeline may follow in her father's footsteps some day and become the new Mad Hatter of Wonderland; but for now, she's perfectly happy going to class and being a regular, upbeat kid at Ever After High! Your little fan of the Ever After High series can add this licensed Madeline Hatter Wig with Headpiece to her costume, and look just like her favorite tea-loving character. 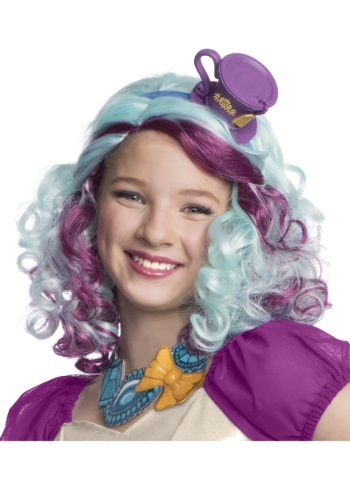 The curly, color-streaked locks will go perfectly with her purple and turquoise outfit, and the matching mini top hat will show everyone that anytime is tea time when she's around!